Are You Struggling to Get Your Dog to Stay? Try This.. Teach your dog to Stay by teaching him to Go! When people visit my training facility, one of the first things they often notice is that our dogs remain on their Place while we fill out paperwork, or get everyone settled into the room. They remain staying even if the visitors are talking to them or is the visiting dog is lunging and barking at them. People notice when my staff and I tell our dogs to lie Down and they actually stay there while we leave the room to gather a few supplies for class. Onlookers are often hypnotized when I unload training equipment and carry it to the practice field. They can't help but notice my dog standing in the back of my car, waiting all the while, the doors and hatch are wide open as I move about for 10 minutes getting things set up. There seems to be a human fascination when a dog can actually Stay as told. Honestly, it is not that difficult and I want to let you in on one of the secrets to building a reliable stay behavior that most people overlook. If you want your dog to learn to Stay you have to teach him when he can Go. It is such a common and easy to fix mistake and yet it is critical to having a high level of success. 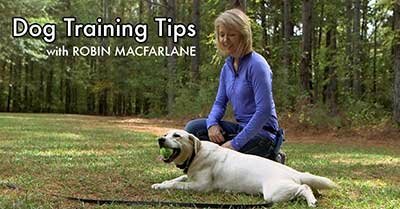 So let me help you with a few tips, because once your dog understands a definitive Go signal (which I am going to refer to as a Release Cue), you only need to prolong the duration they learn to wait for it. Plus, add the distractions you want them to tolerate while they are waiting for that cue. Pick a word or short phrase that is unusual. Something you don't say all the time. I use the phrase "Take a break" with my dogs. That is their cue that times up and you're off the clock, you can go now. Other cues I've heard people use: "Free" "Go" and "At Ease." There is no magic about what word(s) you pick but select something that isn't common in your vocabulary (which is why I avoid OK for most dogs). Attach a leash to your dog's collar. The leash is going to help you show your dog what to do when you say this new word or phrase. Give your dog a stationary command (Sit/Down/Place) and have him hold it for only a few seconds, then say your new release cue simultaneously, AS you use the leash to prompt movement in the dog and free him up. Repeat this sequence a few times; Stationary command, wait a few seconds then prompt movement AS you give the new release cue. The tension on the leash, coupled with slight movement away from the dog prompts him to move. This is how we create an association in the dogs mind with the words "take a break" and the action of movement or freedom. Once the dog demonstrates comprehension that the new words = movement, you can then wean off of applying tension to the leash. That is only needed in the early stage to help show the dog what to do. Next start lengthening the duration between the stationary command and the release cue. If at any point the dog moves or releases himself before you issue the command, put him back. You can't get lazy during this phase, put your dog back into the stationary position each and every time he breaks before you have actually given permission. This is how you proof around distractions as well. You have to follow through and insist that the dog stay in command until you release. Once the dog is clear on this concept the power of having a definitive release cue makes all the difference in your dog's reliability to stay as told. The Go factor of a release command makes working through high levels of distraction so much easier. Now all the exciting distractions around your dog can be used as rewards. You can show your dog he CAN go play with the other dogs, or CAN go chase the squirrels or CAN go eat the treats you tossed on the floor, but ONLY if he hears the release cue. You issue the release if you want to and withhold it if it is not a safe time to let your dog have his freedom. A release cue strengthens the communication between you and your dog because you've effectively taught him to trust you, that a release will be coming and he doesn't need to sneak off to get what he wants. Next Article: There are Only 3 Levels on a Remote Training Collar? Pull-Quote= If you want your dog to learn to Stay, you have to teach him when he can Go!